Personalized Edelweiss House Number Plaque - - one-line round address plaque with a charming border of floral rosettes. Made in the USA. Can be ordered with two 4.5" numbers OR three or four 3" numbers. 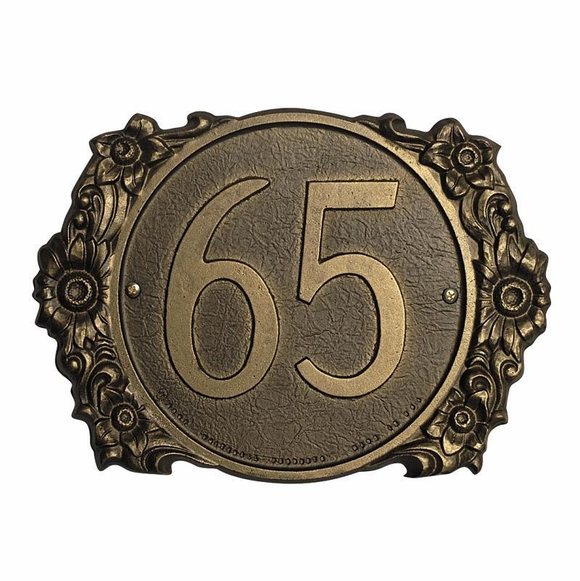 It's easy to add curb appeal and dress up your front porch with a personalized house number plaque. Important editor's note: This sandcast plaque is handmade and handset. As a result there will be slight variations and imperfections. On this plaque more so than others, and especially when you are ordering 2 numbers, the numbers may be somewhat crooked and/or not in alignment with each other because of the handmade process.